Solbus in partnership with GAZPROM Germania, a Berlin-based daughter company of GAZPROM, and Polish municipal transport companies organized a series of demo-runs of LNG buses during April and May. Two Solbus LNG buses have made over 12 thousand kilometers when servicing regular lines in the host cities of Torun, Gdynia, Olsztyn, Warsaw, Cracow and Katowice. The buses were refueled from the mobile LNG station delivered by Gazprom Germania. 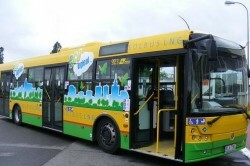 According to its press report, Solbus is the only European OEM that offers LNG-fuelled buses at the moment. The Polish bus builder believes that liquefied natural gas will become the fuel of choice for European transport companies when Euro 6 emission standard is implemented in 2015. The company is committed to the further development of LNG propulsion systems also for its intercity range of models. The testing program has proved that LNG technology is safe and relatively easy to adopt for transport companies. The initial results prove that LNG-fueled city buses are competitive in terms of fuel cost to today’s Euro 5 diesel vehicles. The recorded LNG consumption in kilograms per 100 km was, in equivalent terms, 10% lower than the number of liters of diesel burned on the same routes by Euro 5 diesel counterparts. Since LNG is considerably less expensive then diesel in most European countries, LNG vehicles have the potential to save up to 35% of fuel costs compared to diesel. The introduction of Euro 6 emission standard will make LNG even more attractive, as Euro 6 diesel engines will be more expensive and consume more fuel than presently available Euro 5 ones. The feed back from the companies involved in the program revealed the number of advantages of LNG-fueled city buses. The most noteworthy gain of LNG technology seems to be the refueling time. Some of the Polish municipal transport operators had given up their plans to use natural gas in the past because they would have to change the way they maintain their fleets in order to use CNG. They refuel their diesel buses immediately after they come back from the city and they clean them later during the night. This means that most of their vehicles are refueled in the peak time around 10-11 p.m. Since it takes from couple of minutes to a couple of hours to refuel one CNG city bus, such maintenance process is not possible. LNG overcomes this problem by offering very short refueling time of around 3-4 minutes per one bus. CNG and LNG have the same chemical composition – both are methane. The difference lies in the fuel storage system. Methane when liquefied shrinks 600 times and requires 3 times less tank volume than the same amount of methane compressed to 200 bars. Smaller tank volume allows for higher driving range and lower curb weight, which makes the LNG bus more economical. The less spacious and lighter LNG tank can be mounted within the bus’ bodywork, so the Solbus LNG buses look exactly the same as the diesel versions, contrasting to the CNG vehicles with roof-mounted cylinders. As the Polish transportation companies report, their standard height make LNG buses able to serve the routes passing under low bridges inaccessible for CNG buses. The drivers liked the LNG buses too. They enjoyed powerful 320 HP natural gas engine, which provides “stunning acceleration”, comparable to the most agile city buses with diesel engines. They also reported that the LNG buses handle better on road than their CNG counterparts because of the lower center of gravity.